With a strong grounding in archetypal characters, Uncle Jack brings us a uniquely Australian perspective on war and its aftermath. Based on the diary of playwright Ross Lonnie’s father, this play is firmly set in the Australia of the ’60s, still experiencing its post war growth and still dealing with the personal scars. At heart this is a two hander, with Quintin George playing Uncle Jack and Ben Hall playing both the older and younger McNab. Sent by his father to work on an old war buddy’s farm for a summer, 17 year old Doug McNab has a lot to learn about life. Overshadowed by his war hero father (who he is in danger of becoming a vague disappointment to) Doug forms a friendship with Uncle Jack and learns about life. However, Jack also bears signs of trauma. Self medicating with alcohol and suffering from night terrors and vivid flashbacks, he seems a danger to himself and those around him. Through these flashbacks we learn of Jack’s wartime experiences, and the difference between reality and myth. Performed on a stage that is purely a circle of dirt, George and Hall make great use of this minimalist staging to effectively portray both eras of history. Constantly flashing back in time, the audience is often plunged into a bloody battle as Jack and McNab Snr. struggle to survive. Yet core to Uncle Jack is the concept of mateship, be it found in a two-up ring in the Middle East, or clearing a rocky paddock in the Southwest. Quintin George proves a dab hand as the titular character, granting him the right amount of larrikin affability combined with pathos. Hall manages to pull off a fairly seamless transition between the older and younger McNab, as well as showcasing his multiple talents. 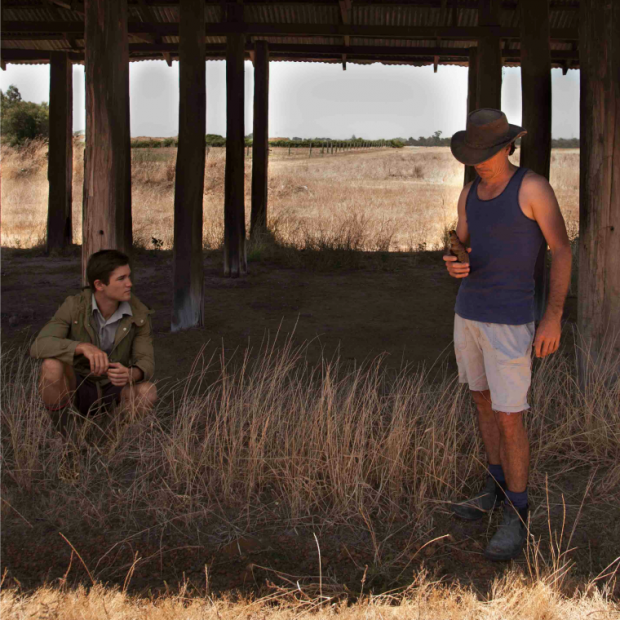 With it’s combination of poetry, song, diary entries, and character recollections Uncle Jack manages to bring a nuanced view to the Australian war experience. An important and timely remembrance. Uncle Jack is on at The Blue Room Theatre until May 10. Head here for session times and tickets.